Welcome to My live blackjack…a site dedicated live dealer blackjack. Live blackjack and indeed live casinos generally are a pretty recent phenomenon. The first live casinos of note really only started streaming their games over the internet around 2005, and it has only been in the last couple of years that this new gaming format has started to gain mainstream awareness. Popular in Asian markets from its inception, only very recently have the large European based online casino operators started pushing it to their players. Games ranges at live casinos are still pretty modest – especially when compared to the older RNG casino games. But fortunately for blackjack players, this very popular game has been taken on board by most casinos/live software developers and added as a base offering. So what’s live online blackjack? Well, put simply, its a game of blackjack played online, but dealt by a real live dealer using real cards. A real-time video of the deal is streamed to the players’ PC along with a game interface that enables bets to be placed, as if the player were sitting at the table before the dealer. - early payout: variation to ‘standard blackjack’ with surrender option at each stage of the deal. Of course the above is a slight over-simplification and a raft of other differences exist from live blackjack game to the next – number of decks used, shuffle policy, slight rule variations (eg can player double after splitting? ), interface features and dealer studio/casino look and feel. But these broad categories are a nice start. So where can you play? Well, below are a bunch of nice casinos – if you are an avid gambler you may well recognize a few of these brands. Some are London Stock Exchange listed, some have over 3 million registered players, some tick both of these boxes. 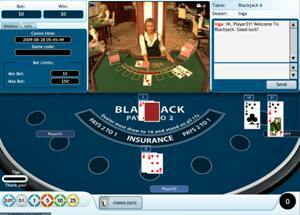 For a detailed discussion of live blackjack, try Livedealer.org’s live blackjack page. Employing an effective card counting strategy is not possible. Most casinos deal their games from an 8 deck shoe and re-shuffle after around 4 decks - limiting advantage players' ability to penetrate the deck sufficiently to get a house edge.